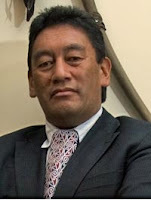 Maori Party MP, Hone Harawira is often in the news, usually over something to do with race or racial agitation. We all know that Hone is brown-he constantly reminds us that he is a champion of Maoridom. But is Hone Harawira really a "beefsteak radical"-brown on the outside, red in the middle? The son of well known radical, Titewhai Tarawira, young Hone was exposed to the radical left from his teens. While a sixth former at St Stephens in Auckland in the early '70s, Hone's mum used to take him to meetings of the Maori/Marxist organisation, Nga Tamatoa (Young Warriors). In 1981 Harawira was one of 5 Waitangi Action Committee members jailed, in Whangarei over Waitangi Day protests- the group called themselves Nga Kuri Otu (dogs of war). In April 1981 Harawira wrote article in HART's "Amandla" on Maori and Polynesian Groups against the Springbok Tour-he signed on behalf of the Maori Peoples Liberation Movement of Aoteoroa. In June 1982 Harawira wrote an an article for the Trotsyist paper, Socialist Action (then edited by Keith Locke) entitled "Unemployed for the Army ?" "to recognize Pacific people have a common struggle, we have a common threat of white death". In January 1990, Harawira was spokesman for protest group Kia Whaka-taara. He stated his goal was a Maori Parliament with control over New Zealand. The Maori population was about 1 million when the Europeans came. We had a stable society with our own social controls, our own conservation methods, our own rules of behaviour towards one another. When Pakehas (white people) came, they brought crime and diseases which almost wiped us out. The population dropped to 40,000 between 1800 and 1900. More died from disease than the big wars we had with the Pakehas. The population is now around 500,000-600,000. Japanese Communist Party; the Korean Confederation of Trade Unions; the Sanlakas national democratic federation, the Union for Socialist Ideas and Action (BISIG), the Women's Health organisation, the socialist youth Kamalayan, the Akbayan peoples party, Initiatives for International Dialogue, all from the Philippines; the Thai Assembly for the Poor; the Malaysian People's Party; the Singapore Workers Party; the Singapore Democratic Party; the Indonesian People's Democratic Party (PRD); the Free Aceh Movement; Fretilin; the All Burma Students Democratic Federation; the All Burma Students Democratic Organisation; Karen and Mon representatives; the Cambodian Documentation Centre; the Cambodian Women's Development Agency; the Pakistani Labour Party; the Sri Lankan New Socialist Party; the Communist Party of India-ML (Liberation); Melanesian Solidarity from Papua New Guinea; the Bougainville Interim Government; the New Zealand Alliance and NewLabour Party; Maori representatives from the New Zealand NGO Corso; the Polynesian Liberation Front from Tahiti; and the Free West Papua Movement. The Maori Party noted the temporary handover of power in Cuba following Fidel Castro's emergency hospitalisation, and expressed concern for the security of the Cuban government during this period of uncertainty. "Castro has earned a formidable reputation as the world's longest-ruling head of government, ever since the Cuban revolution of 1959," said Hone Harawira, Maori Party Disarmament spokesperson, "and he won and holds his power in the face of continued efforts to unseat him, by the United States of America." "I have a real fear that the US will try to destabilise Cuba during this time, in the same way they have undermined many other left-wing governments in Central and South America over the years," said Harawira. "The move to leftist and indigenous governments in Latin America, with the election of people such as Evo Morales in Bolivia, Victor Chavez in Venezuela, and the close run of Lopez Orbrador in Mexico, will not have escaped the attention of the United States," said Mr Harawira. "This period of uncertainty in Cuba could well be seen by them as an opportunity to claw back lost ground”. "Furthermore, armed invasions by the USA to impose 'freedom and democracy', in Grenada and in Nicaragua in the 1980s, and the Middle East over the last few years, suggests that such a possibility exists in Cuba right now," said Mr Harawira. "History tells us how the United States works," said Mr Harawira, "and the Maori Party urges the New Zealand government to send a strong message to the United States of America, that we would not support any illegal invasion of Cuba." Nga Tamatoa commies ? Harawira a commie ? What've you been ingesting Trev ? Even under the influence of a residual hangover from your ZAP days I'm sure you don't really believe that. You're getting worse than our fanatical zionist friend Mah of NY. Have some respect for yourself man ! How do you think the Warriors will go next week Steve? I'm picking a clean sweep through to the finals. You may be on my side anyway and have simply failed to properly read my facetiousness - a veritably proper tool. If I am wrong and indeed you believe (like the earth is flat) that Nga Tamatoa were commies, then I must implore you to use another veritably proper tool - the question mark. Finally, Anonymous, I'm obliged to take issue with you on the "ugly" bit. Photographs in my successive passports, and the choice time I've had during my lifetime in the sensual art, would actually suggest otherwise. Is this a bad case of "projection" perhaps ? Never mind Anonymous, it's what on the inside that counts. Perhaps you could sign up for one of those excruciating "makeover" shows. On more important matters Trev, and since I'm more or less with you on conspiracy theories, I know we have the talent and the balls, but can you see one of George W. Howard's NRL referees EVER letting the Warriors win a Grand Final ?